Feed water produced by distillation for use in a boiler is not “pure”, even with a good distillation method. Worse still is ordinary water taken from ashore to be used as feed water. ”General wastage” is the overall reduction of metal thickness and is common in heating surface areas, such as boiler tube walls. 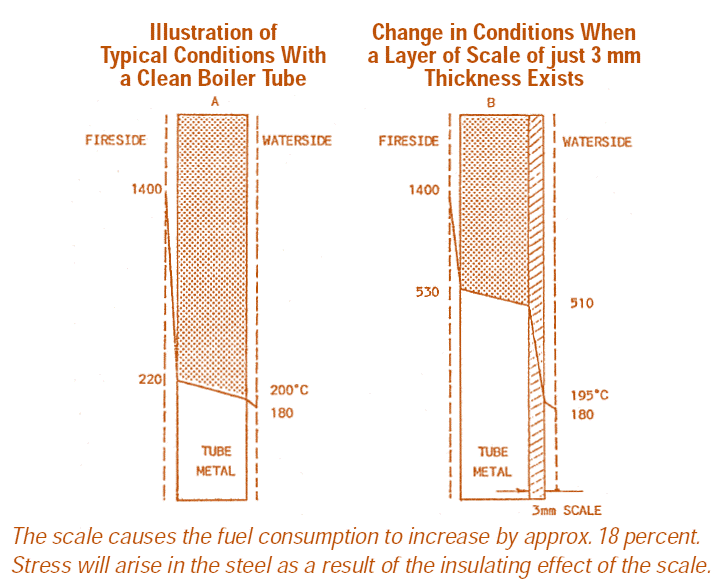 This “thinning” of boiler tubes is often found in boilers having open feed systems (mostly auxiliary boilers) without any protective treatment. An example of wastage is given in the figure below. the figure below. Evidence of pitting is usually found in the boiler shell around the water level and is most likely caused by poor storage procedures when the boiler is shut down for lengthy periods, and by inadequate Oxygen scavenging. 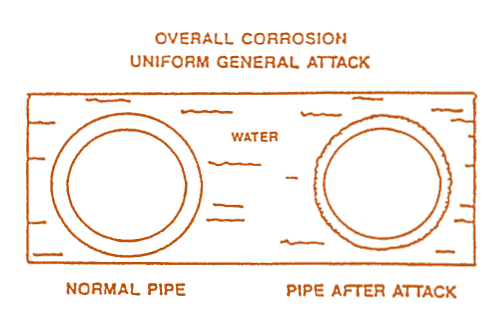 “Stress corrosion” cracking is the process caused by the combined action of heavy stress and a corrosive environment. 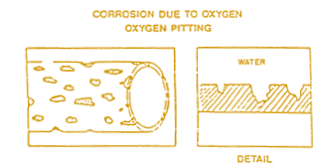 The stages of failure of the metal due to stress corrosion are shown below. around the ogee ring in vertical auxiliary boilers, when undue stressing is set up by poor steam-raising procedures. If the inside of a boiler is scaled, there is a great risk that the boiler material will overheat, leading to tube failure. The efficiency of operation will also be adversely affected. Hardness in the feed water will usually present problems in relation to the operation of boilers. Hardness of more than 5dH° (90 ppm as CaCO3) in the feed water will, as the temperature rises, cause an increase in the formation of sludge in the feed water tank. If scale-preventing chemicals are put into the feed water tank, this problem will be aggravated, as nearly all precipitation of sludge will take place in the feed water tank. may be blocked, which will cause the pump to stop. 1. The capacity of the water treatment system is insufficient. 2. There are defects in the water treatment system. Daily analysis of the quality of the feed water will ensure that action can be taken in time to prevent irregularities. Hardness in the boiler water will inevitably lead to the formation of scale and the rate of this formation will depend on the composition and quantity of the hardness, on the temperature conditions in the boiler and on the circulation in the boiler. Increased surface heating effect means increased production of steam bubbles, which again will make more boiler water “pass” the spot on the heating surface (where the steam bubbles are formed) and this spot will thus also be “passed” by the hardness-producing and corroding salts in the boiler water. In addition, the most common hardness salts are less soluble at increasing temperatures. This explains why the largest amount of encrustation will always be found where the temperature of the heating surface is the highest. Scale formed just at this point means that the critical temperature of the boiler material will be reached quickly and that damage to the boiler will be inevitable. Carryover is any contaminant that leaves the boiler with the steam. Carryover in super heaters can promote failure due to overheating. Turbines are prone to damage by carryover, as solid particles in steam can erode turbine parts. When large slugs of water carry over with steam, the thermal and mechanical shock can cause severe damage. The most common form of encrustation in a steam system stems from carryover. The boiler manufacturers stipulate a maximum allowed salinity of the boiler water (as a rule at 0.4° Be = 4000 mg salts dissolved per litre). If this value is exceeded, there is a risk of normal bubble size being prevented; larger bubbles will be produced and the turbulence in the water surface will increase and cause foaming. The foam may be carried over with the steam, particularly when the generation of steam is at maximum, which causes boiler water (containing Sodium Hydroxide and salt) to pass out into the steam pipes. The content of Silicic Acid is important for boilers with high pressures. Silicic Acid in its volatile form may be carried away with the steam and be deposited on turbine blades, for instance, on which it will form a very hard, porcelaine-like scale. However, not only the chemical composition may cause carryover. Circumstances such as periodic overloads, periods of a too high a water level (or more correctly: too small a steam volume) are two of the most common causes. Finally, impurities from the condensate, such as oil from the preheater’s coils if they are leaking are very common causes of priming. Very informative.I appreciate the way the article is written in a detailed manner Corrosion is a disaster specially in industries,marine industries etc.Thanks for sharing such article on corrosion.